Birthday Theme Continued . . .
Where did those colors come from, you say? Why, HERE of course! Over at SplitcoastStampers there's a whole list of daily/weekly challenges, so if you ever get stumped for an idea of what to stamp, just check out those lists! I had been playing around with how to do an "out of the box" look with this beautiful flower (from SU's Spring mini catalog due out Thursday, March 1) and found a Coluzzle template I had forgotten about (gee, imagine that!). It had the rectangle box AND scalloped border that fit this design perfectly, I thought. By placing the clear template over the images I had already stamped (on shimmer white which is the cause of the glare in the photo but oh so beautiful to work with), I was able to see exactly where I wanted to position the rectangle and leave the flower's petals sticking out, to trim around. I did a little piercing on the caribbean scalloped border and eggplant mat. The celery card base is stamped with the doodle flourish from this set (seriously my favorite set in quite some time!). 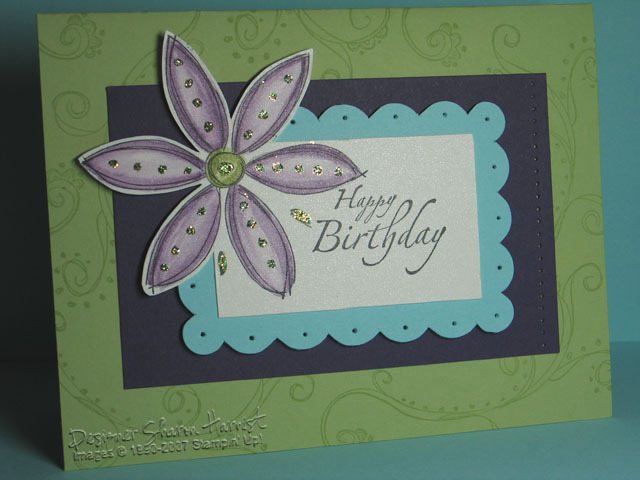 Lime green Stickles highlight the flower, which was watercolored with eggplant reinker. The flower and scalloped piece is popped up on dimensionals. Thanks for looking! I hope to have a few more birthday cards to post this week . . . they're something we all can use, right?!! 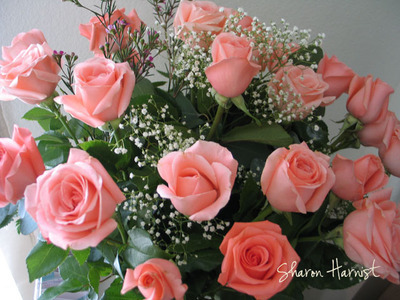 These are my favorite color of roses: peachy-pink. When I got back home from a weekend with the girls, I found 2 dozen of these! My wonderful hubby and girls had picked them out to surprise me for my birthday. How sweet is that?!! I didn't get a chance to post a few more cards I intended to make this week because I'm heading off today to a stamping event . . . a roadtrip for a girl's weekend! 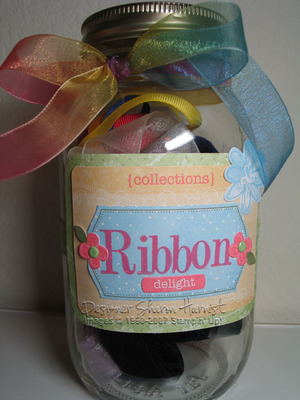 I made this ribbon jar for a door prize at the event, so I thought I'd share. 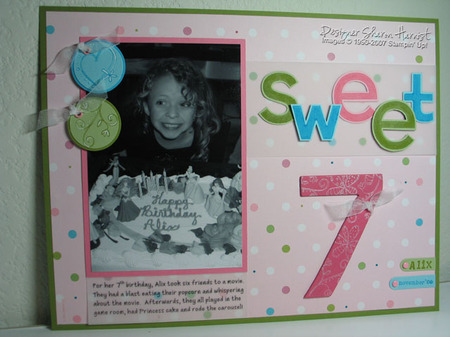 Once again, I used that wonderful scrappin' kit, Just Delightful. The only thing I stamped on this was "Ribbon" (in Regal Rose craft ink using Stampin' Up's Typeset alphabet) and then layered tags and embellshments from the kit. Then I mounted it on the celery printed cardstock from the kit. Tip: I learned the hard way that you need to use Glue Dots or preferably Sticky Strip/Tacky Tape/red liner tape to adhere the sticker layers together AND to get the label to adhere well to the large canning jar (purchased at Michael's for $1-something). Because of the curvature of the jar (although I didn't think it was significant) Xyron adhesive didn't hold well. Live and learn. A pretty 3/4" ribbon sticker from the kit wraps around the center of the jar, behind the label -- maybe you can see a smidge of it on left side? Rainbow organdy ribbon (retired SU) ties off the top. A delightful end to a delightful birthday week! So here's a card I made for a publication submission (rejected, can you believe it?!!) from which I made my new blog banner! BasicGrey Blush paper and a humongo Heidi Swapp flower. It's on a card base of cocoa. 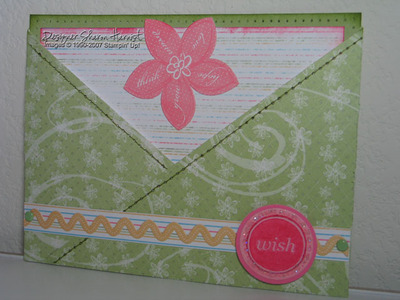 "Wish" is from SU's Think Big set that was in the Holiday mini catalog. It is popped up and an epoxy sticker covers it. Big brown MM brad. Enjoy!
. . . for the feedback about the banner/new look. I've changed some settings and hopefully it's looking a little better -- a little too squished for my taste but what do you expect for doing it yourself for the first time?!! I think I may need professional help but that will have to wait until sometime next week when I have a chance to breathe! If you aren't seeing a big pink flower, pink & brown paisley background and pink sidebars, then you may need to delete your cookies or hold down your CTRL key while refreshing the page. I didn't know the new look went live and I'm not sure I like it -- let me know if you do or not, no hard feelings! I think the banner may be too big on some viewers? Hopefully I'll get my next birthday card posted later today -- my computer with those photos on it is giving me fits this morning! The Well Worn Words background was stamped in Rose Romance craft ink onto Pretty in Pink cardstock and while it was still moist, I pounced Rose Red chalk onto the background to achieve a two-tone mottled effect. The craft ink holds the chalk similar to Poppin' Pastels technique. After watercoloring Delight in Life (one of this season's SU Sellabration sets) flowers on Pretty in Pink background, I overstamped the Linen background in Rose Romance. I clipped the corners of the focal piece and background with SU's Ticket Corner punch. Sentiment (Small Sayings) was stamped and punched with SU's Lg Oval punch, the edges also chalked in Rose Red, and placed on the background so it would show it would better on the busy background. Burgundy wide organdy ribbon and Prima flowers add the finishing touches. 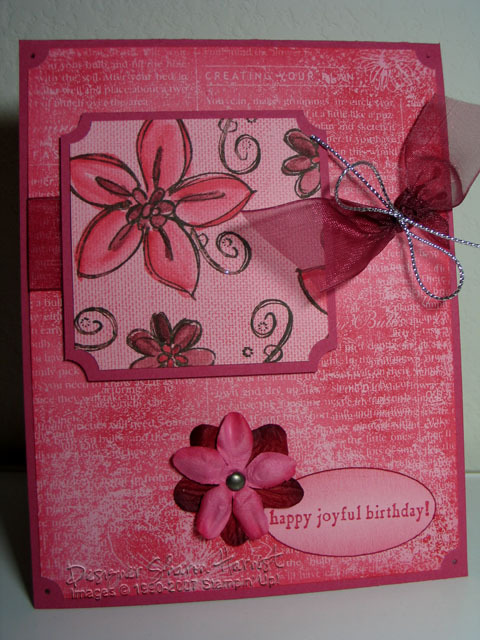 You can read more about how this card evolved in my gallery at SplitcoastStampers. Well it seems this week's theme will be birthdays . . . not only because mine is the end of the week, but because I've missed a few of my family and friends' birthdays recently and I needed to play catch up! This card is based on the Technique Lover's Challenge over at SplitcoastStampers.com. Since I still had SU's Sellabration Scrap Kit (Just Delightful) out on my desk, I grabbed it to make this pretty Spring pocket card. I used the patterned cardstock from the kit, along with a couple of stickers. The pink flower sticker "tab" serves as a decoration and to pull out the striped card where you can write a message. "Wish" is from SU's Think Big set from the Holiday mini catalog, which I really hope makes it into the next regular catalog. I stamped it, punched it out and adhered it to another circle sticker from the kit. It is popped up and glitterfied! The rick-rack strip is also a sticker from the kit. I faux stitched the criss-crossed flaps and along the inside of the card base and sponged the edges of the card pull-out. This card still fits in a regular A-2 sized envelope for mailing. I actually constructed my card a little differently than the link above and when I get time, I'll photograph a tutorial for you. Check back tomorrow for another birthday card! I was trying to use this doodle flower piece that I had previously watercolored (Doodle This from the upcoming SU Spring mini catalog, punched out with Marvy Giga Scalloped Circle) and happened to catch this week's Color Challenge over at SplitcoastStampers. It wasn't until I finished the card and rechecked the challenge that I realized I had used Rose Red instead of Cranberry, but I think it's close enough -- how about you?!! Other cardstock colors are saffron and celery. Having a bunch of leftover scraps from this season's Stampin' Up! Sell-a-bration scrap kit, I realized they were exactly the colors of my flower and decided to throw them together and this is what I came up with! The scrap kit's printed paper made this design come together very nicely, since the colors are already coordinated for you. The little "happy" piece is a sticker from the kit -- I just added some brads and put it on dimensionals. The celery photo corner is also a sticker. Doodles from this stamp set (LOVE them!) were stamped on the rose red card base in rose red classic ink. Glitter finishes off the flower (of course, what is a card without a little bling? LOL!). This card is going out to a sweet stampin' friend whose birthday I missed this month and I hope she forgives me for being late! I'm not usually a blue cheese salad dressing kind of gal, but when friends of ours made this salad for us for dinner one night, I loved it! I didn't think about making this for dinner this week until I was at the grocery store and remembered I wanted to try it. Not remembering what all was in the recipe, I grabbed some buttermilk (NOT usually on my normal shopping list!) and figured with the blue cheese I knew I had at home, this should just about do it . . . wrong! I had No other ingredients the recipe called for (including some spice mix I have never heard of! 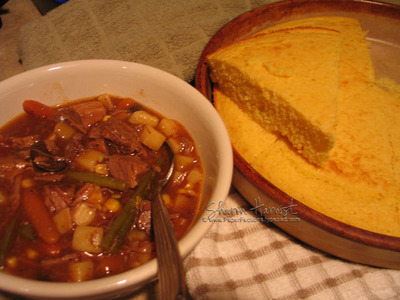 ), so I started substituting with what I had and came up with this recipe . . . fortunately, we loved it so I thought I'd share it with you all. It's not at all as pungent as what I've tried before in restaurants, so I hope you like it, too! Blend well in a blender. After blending, pour into jar/container with lid and add 3-4 more oz. blue cheese crumbles. Shake jar to blend. Best if sits overnight in fridge. Makes a little more than 1 pint. 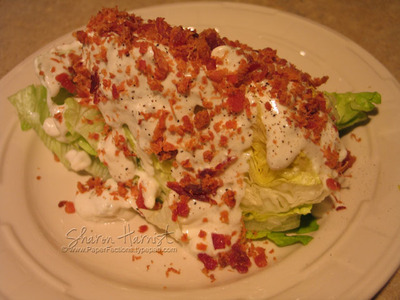 Serve over a wedge (1/4 of a head) of iceberg lettuce and sprinkle with real bacon bits. Enjoy! A little late for Valentine's Day but I wanted to wish each of you a Happy Heart Week & Warmest Wishes -- how's that?!! I ADORE this new Au Chocolat double-sided designer paper that SU will have in the Spring mini catalog which starts March 1, so here's a little preview! 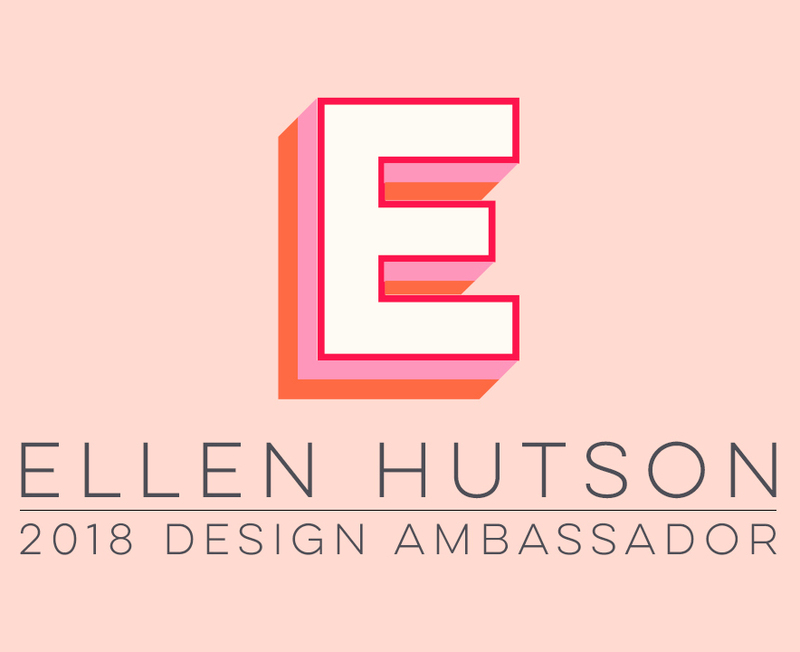 All the designs in the collection are vanilla, cocoa and chocolate and GORGEOUS patterns (I think -- DH has a varying opinion on them and thinks they are boring -- <insert rolling eyes>!! . . . what do men know about design anyway, right? LOL!). 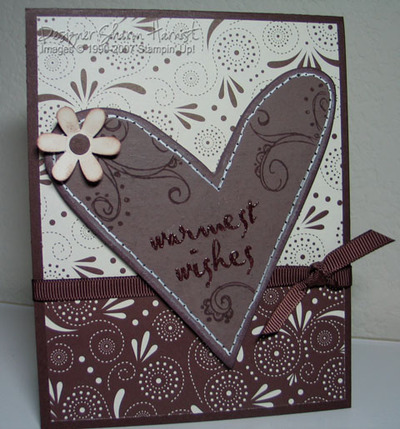 Anyway, to go with this paper I inked the chipboard heart in cocoa craft ink and allowed it to dry. Then I pierced holes in it and faux stitched them with white gel pen. After stamping and embossing the sentiment, I thought it needed something else so I reached for another new stamp set from SU's Spring mini, Doodle This (it's a larger version of Doodle That which I used on the scrapbook page in the post below). I masked the stitching I had already created and stamped the doodles in chocolate craft ink. I finished off with a punched flower and chocolate ribbon. I hope each of you had a warm & fuzzy "heart" week . . . I certainly did! So here's the other scrapbook page I promised. I rarely get time to scrap anymore and wanted to try something new -- a landscape layout (11"x8.5"), as it seems to currently be the rage. I had just received this new designer paper (Petals & Paisleys ) from SU's upcoming Spring mini catalog and these fun colored dots reminded me of party confetti, perfect for a birthday page. Color scheme went from there . . . the cut-out Big Deal alpha letters' colors were mimicked from the dots. Two of the letters are popped up and a piece of vellum is behind them, to soften the focus of the dots. A new stamp set from the Spring mini, Doodle That, was stamped in white craft ink onto the chipboard number which had been inked with Regal Rose craft ink and dried. The white doodles were clear embossed. I used more doodles on the circle embellishments and highlighted them with white gel pen. They are popped up and tied with white narrow organdy thru eyelets. Tabs on the lower right are stamped with her name and date, punched with SU's Word Window punch and are secured with pink brads. Journaling was printed onto vellum and is adhered underneath the photo. I love the big smile on my sweet seven-year old and hope you enjoy this page, too! My ink pad holders just arrived last night from Storage Units, Ink -- thanks again, Denise! You'll also find their link over on the right in the "Where I spend too much time" category! I still have a little filling up and organizing to do but here they are. I'm going to leave them unpainted for now, in case I want to match a wood stain in my next house (we're in temporary housing, between home purchases -- ugh!). So for now, this will give me a little more stamping space (which is the lower left of this photo). 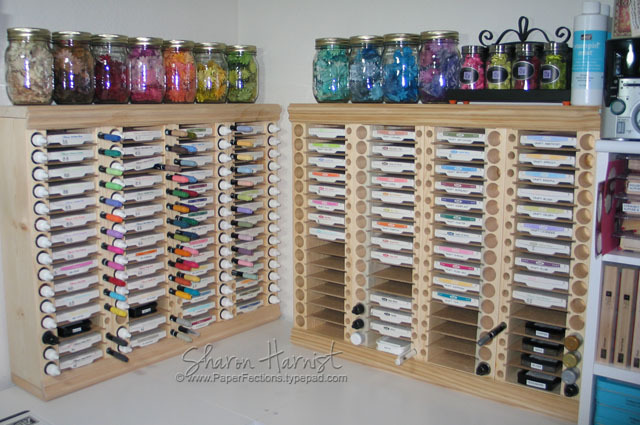 Those pretty jars on top of the units are how I organized all those Prima flowers I got from Confessions of a Ribbon Addict. I gave my two little girls a lesson on color theory & shades of the spectrum and they went to town sorting, LOL! The jars are are pint-size canning jars that Mike's was selling for .99 cents each as ribbon organizers (they also had larger ones). Had I known I would use 11 of them, I think it might have been less expensive to just purchase them by the dozen from a "mart" store or my local grocery store! I also added a new photo album over on the right of my stamping space, so you can see it all and what these units replaced. The photos were taken when I first moved, before I had done any stamping, so please don't think it's always that neat! I want you to know I was so proud of myself for actually remembering to use leftovers (in a timely fasion!) that I thought I'd share what was for dinner tonight. This recipe started out the other night as Beef Pot Roast with Garlic Tomato Wine Sauce (with carrots and onions). In addition to the recipe, I added sliced baby portebello mushrooms with a side of fresh green beans. I dumped all the leftovers into one pot (roast w/vegetables, gravy, green beans). So tonight, all I did was cut up the roast into bite-sized pieces, add one small can of corn, one large can of cubed new potatoes and reheated everything together with one 32 oz. box of beef stock. Let simmer and bake up a pan of corn bread . . . instant dinner! I like unsual or unexpected things so while these colors may not be your usual "Valentine" ones, I like the way this turned out. I used markers to color directly on the rubber stamp, doing some shading along the way. Stitching around the main image is faux . . . learn more about faux sewing in my tutorial over at SplitcoastStampers.com. 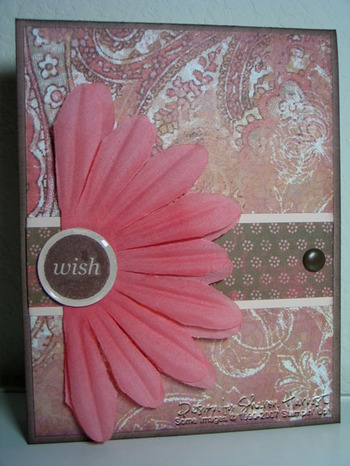 Edges of rose red mat were distressed with the distressing tool in the Cutter Kit by Stampin' Up! 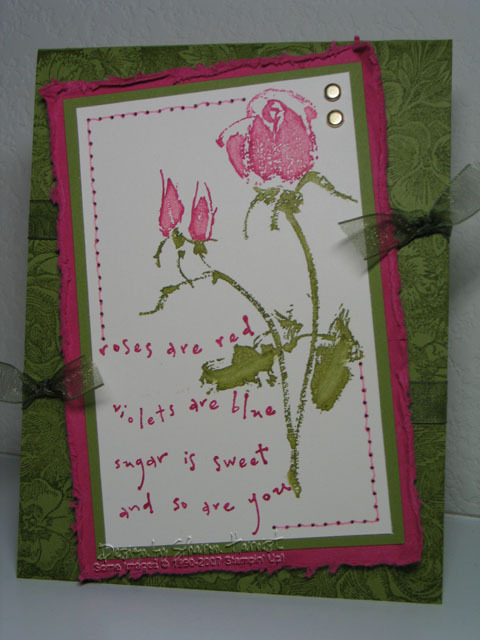 Brush Rose and Roses Are Red sentiment by Penny Black. 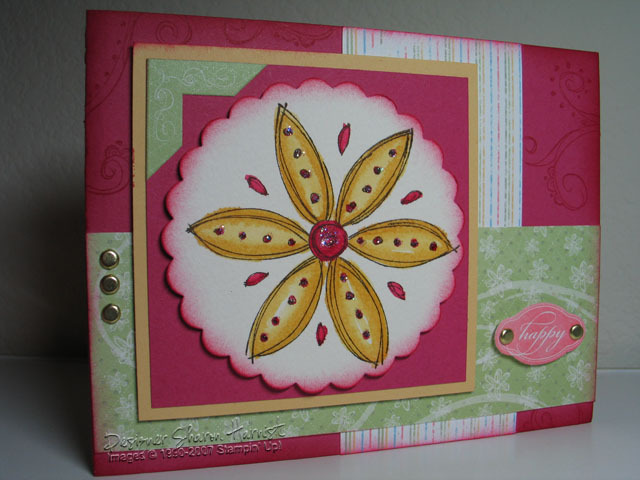 Floral background and all other supplies by Stampin' Up! Those wooden stamp pad holders I mentioned a few posts below are due to arrive tomorrow. 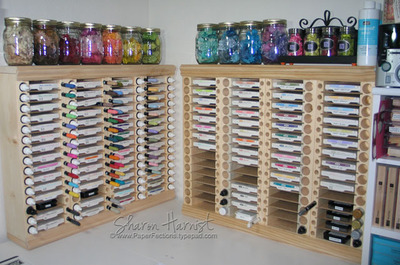 So check back sometime this weekend and hopefully I'll have photos of them in my stampin' space to share with you, along with how I organized all those Primas!